« Creativity and Life Coaching…what does that mean? Spider Web ~ Rainbow Portal…. I was washing dishes and out of the corner of my eye, saw something twinkle as the sun shifted the shadows. This is what I saw….isn’t it just beautiful? There I was washing dishes, oblivious that only a few feet away a Master Weaver had completed her latest work…. I have written about SpiderWoman here: SpiderWoman Creating in the Night…. 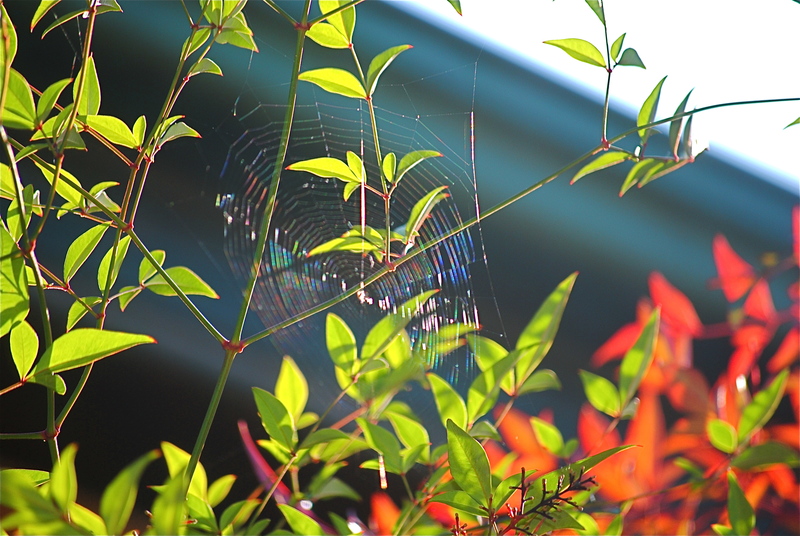 This entry was posted on July 27, 2010 at 10.34	and is filed under Beauty, Creativity, Garden, Magic, Nature, Rainbows, Spider Web, Spiderwoman. You can follow any responses to this entry through the RSS 2.0 feed. You can leave a response, or trackback from your own site. Gorgeous photo. My granddaughters and I have a “pet” weaver on our camellia shrub. We check her every day. My girls (age 4 and 7) named her Charlotte.